Contemporary-style rooms, free Wi-Fi and a restaurant serving European cuisine is offered at the Hotel Carpe Diem. It is situated in the heart of Gudauri, which is a popular ski resort. Guests can enjoy a rich breakfast buffet each morning at the Hotel Carpe Diem. In the evenings, local and European dishes are served in the elegant hotel restaurant. Decorated in neutral colour schemes, all rooms at the Hotel Carpe Diem come with a flat-screen TV and a minibar. All of the private bathrooms feature a shower and toiletries. Entertainment option at the hotel include a disco club and a cinema hall. You can also relax in the on-site spa centre with its sauna facilities. The central ski lift is just 100 metres away, and the nearest bus stop can be reached in 15 minutes on foot. Situato nella località sciistica di Gudauri, questo hotel offre un centro benessere con piscina coperta, camere con TV a schermo piatto e la possibilità di noleggiare l'attrezzatura da sci. Tinteggiate in tonalità neutre, le stanze dell'Hotel Gudauri sono dotate di scrivania, minibar e bagno privato con accappatoi e set di cortesia. Il ristorante in stile classico propone un assortimento di specialità europee e caucasiche, mentre l'accogliente bar vanta un camino e il bar notturno Gudauri ospita intrattenimenti fino alle 03:00. Dopo una giornata dedicata allo sci, gradirete rilassarvi nella sauna e nella vasca idromassaggio, concedervi piacevoli massaggi o divertirvi presso la sala giochi, provvista di tavolo da biliardo e coperta dalla connessione Wi-Fi fruibile a pagamento. L'hotel dista 140 km dall'aeroporto internazionale e 120 km dalla stazione ferroviaria di Tbilisi . Il personale della reception, operativo 24 ore su 24, sarà lieto di organizzare per voi il servizio navetta. Just 550 metres from a ski lift in the Gudauri Ski Resort, this hotel features a sauna, grill bar, and shuttle service to Tbilisi Airport. All rooms have satellite TV. Cosy, individually furnished rooms with wooden floors are offered at the Ozon. 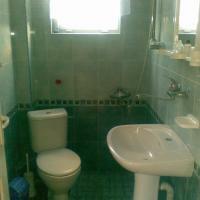 A shower and toiletries are provided in your bathroom. Guests can wake up to a breakfast buffet at the Hotel Ozon. Drinks are served in the rustic Night Bar, which has wooden panelling and stone details. Relaxation is also possible in the lounge with TV and fireplace. The Ozon is a great base for hiking and skiing through the Kazbegi National Park and the Greater Caucasus Mountains. Storage space for skis can be found on site. This hotel is located in the famous Georgian winter resort of Gudauri, 550 metres from the ski lifts. Panama Hotel features rooms with a private bathroom and satellite TV. The bright rooms of the Panama have wooden floors and a dressing room. Guests can enjoy a picturesque mountain view from each room. Panama features a restaurant with Georgian cuisine and a bar. Guests can rent ski equipment at the guesthouse, and there is a ski storage as well. The hotel also offers fishing trips and hiking tours. Tbilisi Train Station is 110 km from the Panama Hotel, Vladikavkaz Train Station, which is in Russia, is 70 km away. Tbilisi International Airport is 120 km from the hotel, and the bus stop to Tbilisi is just 200 metres away. 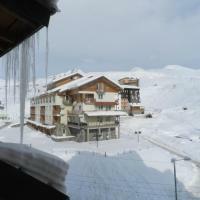 Only 100 metres from Gudauri ski lift, this hotel enjoys a central location in the popular ski resort. It offers rental ski equipment, shared kitchen facilities and homelike rooms with free Wi-Fi access. Mini Hotel George features individually decorated rooms with free toiletries and a TV. Some rooms have a private bathroom and some also include a balcony. The fully equipped kitchen is ideal for preparing home-cooked meals and snacks. Traditional Georgian dishes are served daily in the hotel’s own café. Ski equipment is available to hire and guests can make the most of the on-site ski storage. Visitors can even spend a day exploring the Zarelskoe Ushelye Nature Reserve, 25 km away. Transfers to Tbilisi Airport can be organised by George’s 24-hour reception staff. Gudauri bus stop is 50 metres from the hotel and offers easy connections to Tbilisi (120 km).